Short-tailed groom suit in blue Prince of Wales wool blend. Single matching fabric covered button closure. Peak lapel. 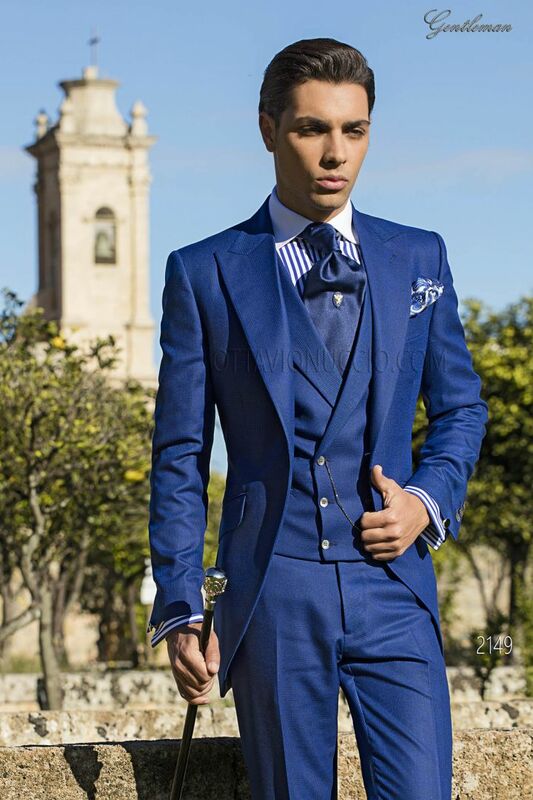 F... Short-tailed groom suit in blue Prince of Wales wool blend. Single matching fabric covered button closure. Peak lapel. Flap pockets and angled buttonholes. Single button for each sleeve and single vent at back. Length of jacket is typically suitable from the groom. Prince of Wales wool blend double-breasted waistcoat with peak lapel 6 mother of pearls buttons on the front, 2 double w... Prince of Wales wool blend double-breasted waistcoat with peak lapel 6 mother of pearls buttons on the front, 2 double welt pockets and lining with elastic band to adjust width.